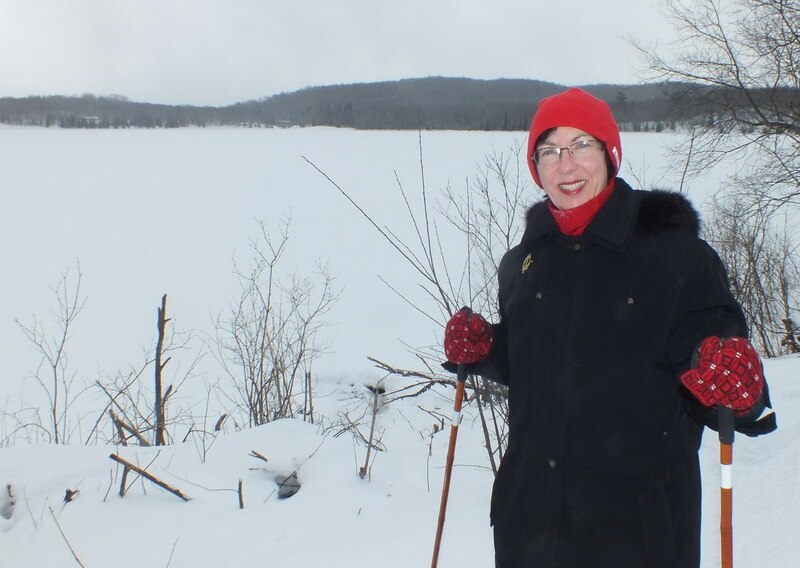 On a winter trip to the Huntsville area, Bob and I decided to check out the ski trails at Arrowhead Provincial Park. Despite having grown up in the vicinity, I had never visited that Park before, always opting instead to go to Algonquin Provincial Park since it was closer to home. 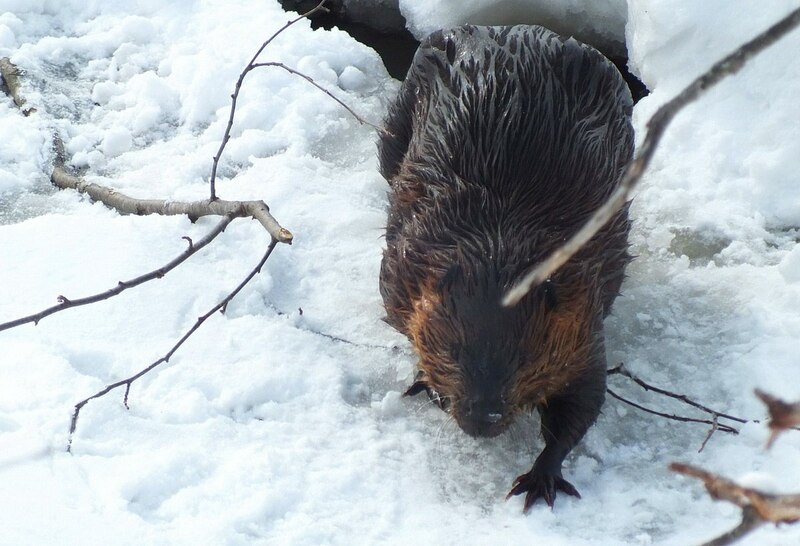 What a delight to find a beaver just off to the side of the groomed ski trail. I was in the lead, and when I drew up at one end of Arrowhead Lake to investigate some fresh tracks in the snow and some telltale signs of recent activity, I saw a small hole in the ice and fresh water that was gently stirring. Because of the sun’s glare and light bouncing up from the snow, I was not sure what else I was seeing. Was it a piece of wood bobbing in the water, or perhaps the stump of a tree sticking through the ice? It was when the object disappeared down the hole leaving a small wake behind that I realized I had been looking at some sort of animal. I suspected it was an otter. I quickly summoned Bob to catch up to me, and there the two of us stood quietly at the side of the ski trail overlooking the lake. We were patient and figured the creature would have to return within a few short minutes to get another breath of fresh air. 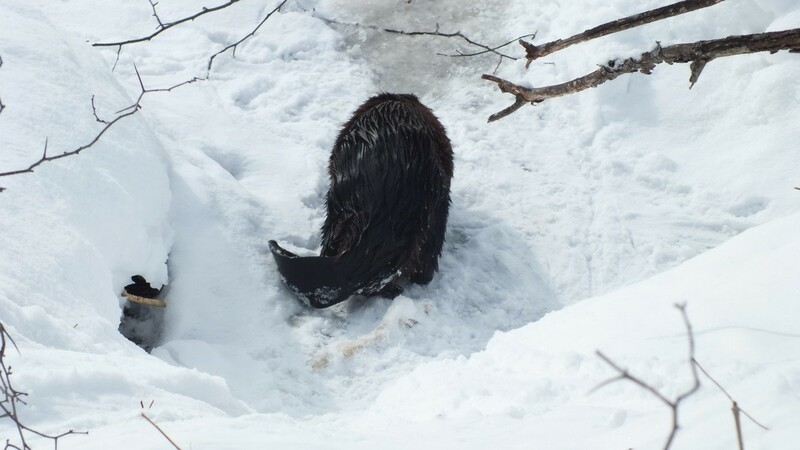 Sure enough, about five minutes later, we saw a disturbance in the water of the hole, a tentative nose break the surface, and then a big beaver promptly pulled itself up onto the ice. 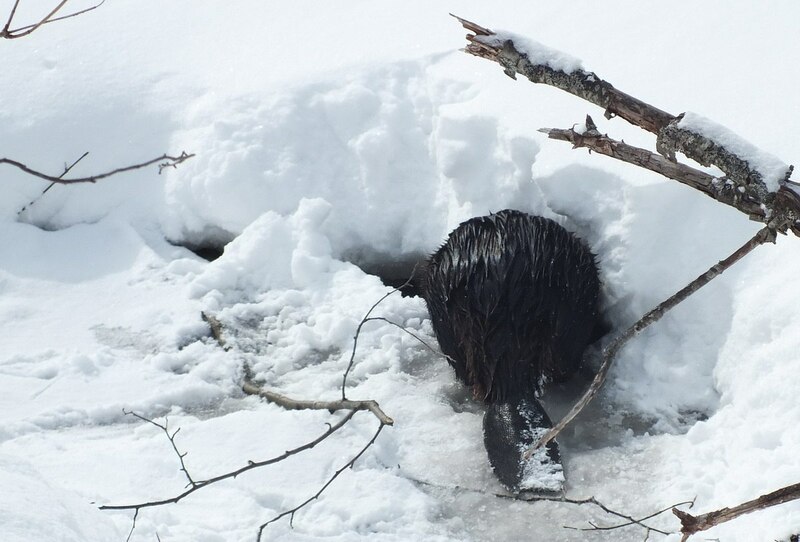 Beavers are capable of remaining underwater for up to 15 minutes, so we felt lucky that it returned to the surface so promptly since the strong winds sweeping across the lake were brutally cold. They were in our favour, however, putting us downwind of the beaver, so knowing that, Bob and I just maintained a statue-like posture and hoped that the beaver would not notice us. The hole in the ice was a mere 20 feet (about 6 metres) distant from our position on the bank. 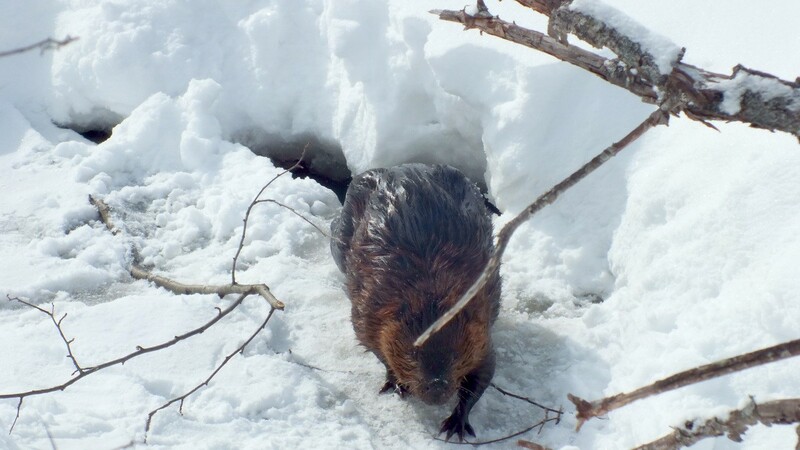 The beaver seemed to be on a mission, making brief forays from the open water towards the shoreline, but frequently, it would hastily retreat to the safety of the hole or the warmth of the water, we were not sure which. North American Beavers are the second largest rodent in the world, the largest in North America, and they are the only species with a broad, flat, scaly tail. An adult Beaver can weigh between 11-32 kilograms (24-71 lbs) and can achieve an overall length of up to 4 feet (1.2 m) including the tail. As the Beaver came in our direction, I began to get a little concerned because they can become aggressive if feeling threatened, and this one was a good size; we didn’t want to get in its way. Bob and I chuckled as the Beaver waddled across the surface of the frozen lake. It was quite ungainly but we know from experience just how graceful a beaver is in the water. They use their large, webbed rear feet as we would use flippers or swimfins, and the paddle-shaped tail acts as a rudder. If you have ever seen a beaver plying the calm waters of a lake, you would know that they can swim very quickly…as much as 5 mph (8 kph). 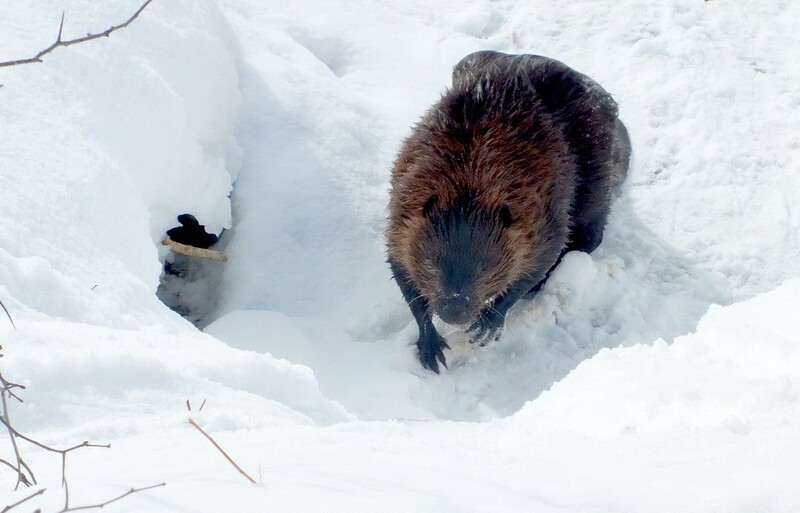 The elliptical-shaped tail also can serve as a prop if a Beaver wants to stand upright, a lever to assist with dragging logs, and as a noisemaker for creating a warning signal. I have never seen a Beaver slap its tail on the water for that purpose, but I think it would be neat. 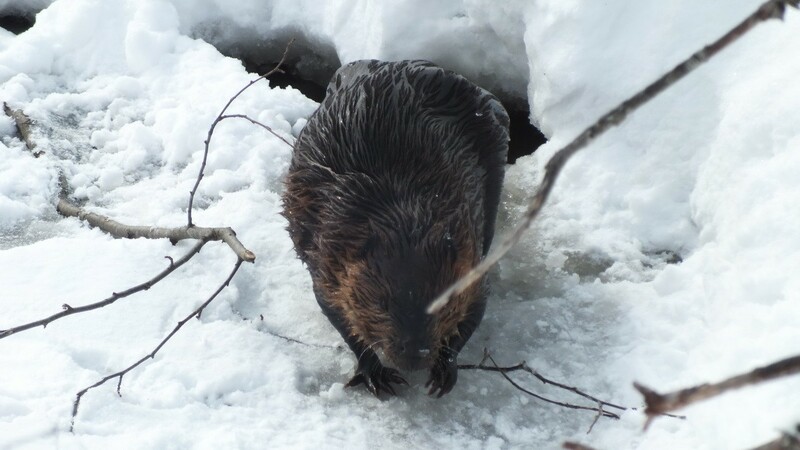 Both the tail and the large webbed hind feet are adaptations that suit the Beaver’s semi-aquatic lifestyle. Other traits that enable a Beaver to lead an underwater way of life are a transparent membrane that covers each eye and allows a Beaver to see underwater, nostrils and ear canals that can be sealed while submerged, cheeks that close behind a Beaver’s front teeth so that it can grasp and tow branches underwater, and a thick layer of fat beneath its skin that acts as insulation against a cold water environment. Add to that a dense layer of underfur that traps warm air next to the Beaver’s skin, and it is one happy aquatic animal. 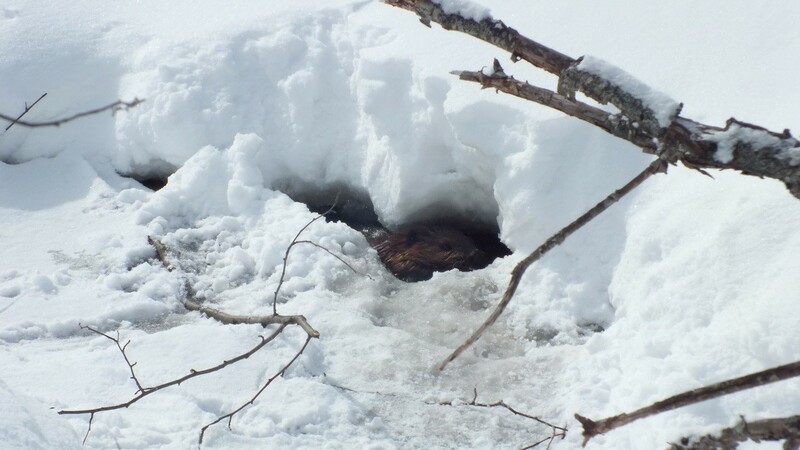 Beavers do not hibernate but instead actively swim and forage all winter long, but they will stockpile food stores during late fall if their lodge happens to be in an area where a thick layer of ice will form over the pond. Freshly-cut branches at that time are pulled underwater and stuck vertically into the mud near their lodge for easy access throughout the winter months. Evidence can usually be seen in the shape of sticks poking up through the ice. A Beaver’s front paws are smaller than the hind feet, with claws on each of the five digits giving a Beaver great dexterity when it comes to handling food. They are able to manipulate small twigs by twirling them like a cob of corn in order to nibble off the bark. Beavers are herbivores that eat a variety of plant matter. During the winter, they rely on their food cache of harvested branches from both deciduous and coniferous shrubs and trees. It is the inner bark or cambium of those branches that the Beavers eat. 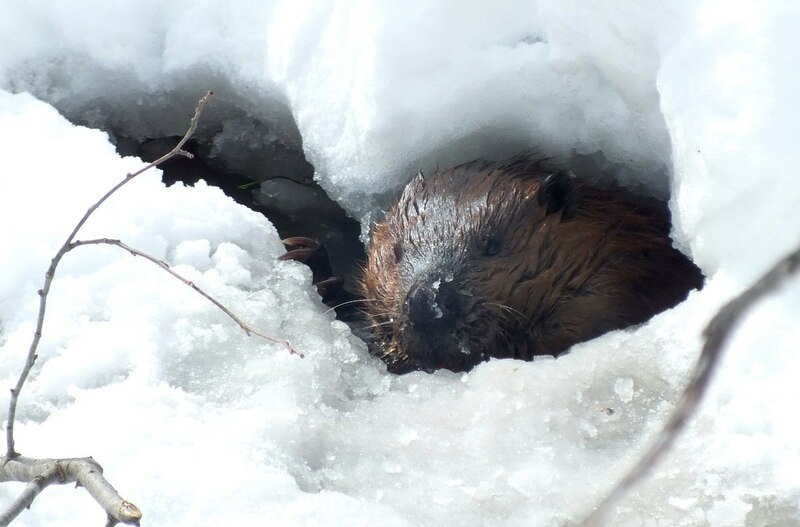 During the growing season, Beavers will consume the cambium, leaves and small twigs from a number of tree species such as aspen, birch, poplar and willow, to name a few. Ferns, grasses, and roots and buds of both aquatic and terrestrial plants are a welcome change from the routine diet with cattails and pond lilies being some of their favourites. 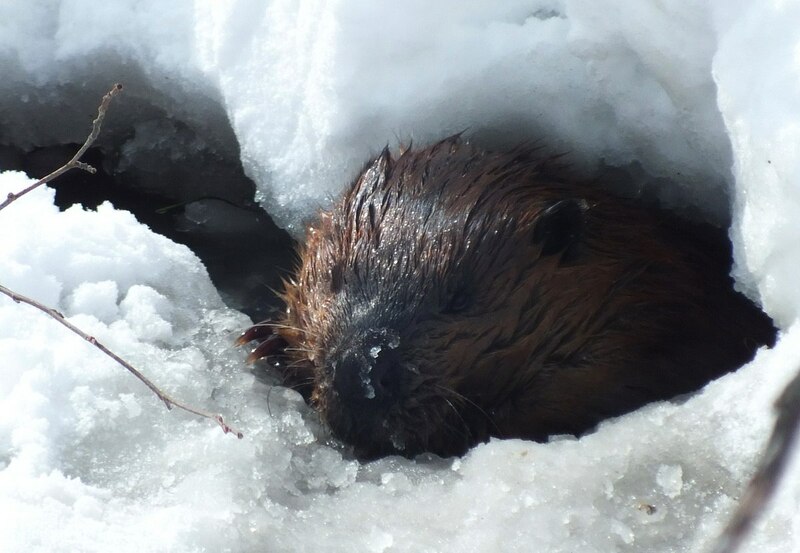 Although winter was far from over when Bob and I came upon this Beaver, it was actively nipping off some fresh twigs and dragging them beneath the ice. Maybe it just needed some fresh greens after a very prolonged spate of cold weather. Beavers are well-suited to this activity because they have very large, sturdy incisors, both upper and lower, that are coated with tough enamel. The enamel ranges in colour from orange to chestnut brown. The difficult work of felling trees and peeling bark wears the teeth down, but because they grow continuously throughout a beaver’s life, the teeth are renewed and self-sharpened. Four times the beaver rambled up the bank towards us, and four times it returned to the water hole giving Bob and I a really great opportunity to observe its movements and habits. It was a stocky animal with a compact body and short legs. 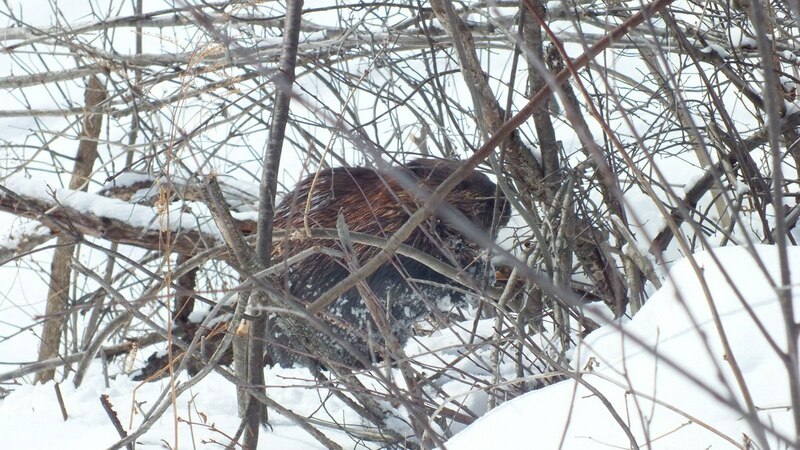 When the Beaver caught some sunlight, we could see a beautiful reddish tinge on the dark brown fur. The outer hairs are long and coarse whereas the undercoat would be finer and lighter in colour. A Beaver’s fur is naturally oily and waterproof due in large part to castoreum, the oil secreted from scent glands at the base of the tail. 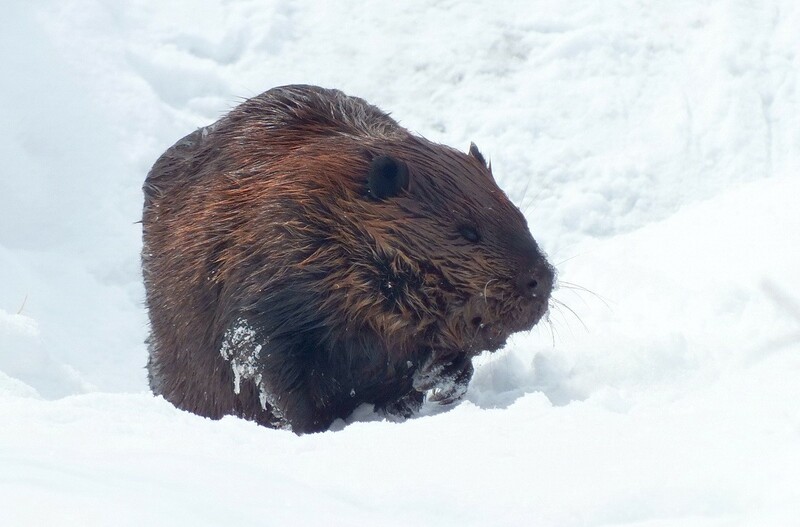 With the comb-like claws on their hind feet, Beavers carefully groom their fur and distribute that castor oil to effectively protect and waterproof their fur. Bob and I were lucky to catch the Beaver out and about that sunny morning because normally they are nocturnal and secretive animals. Not only that! Beavers are prone to stay in the water most of the time because they are more vulnerable when traveling on land, so the fact that we were able to witness this beaver’s foraging skills gave us a unique experience. I wonder what the Beaver would have done had it sensed our presence so close-by. There would have been no slapping its tail on the water to warn fellow lodge mates because the hole in the ice was not large enough to accommodate such an action. 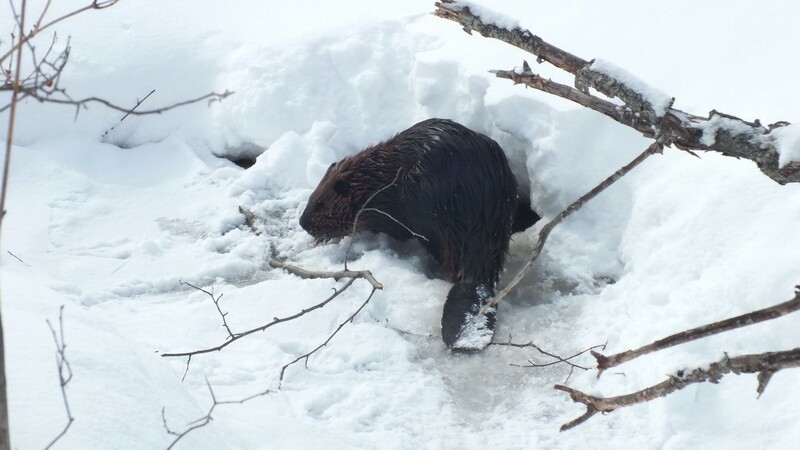 As it was, when the Beaver slipped below the ice once again, Bob and I made to continue skiing along the trail…but not before alerting the next couple of skiers to keep an eye out for a great wildlife sighting.